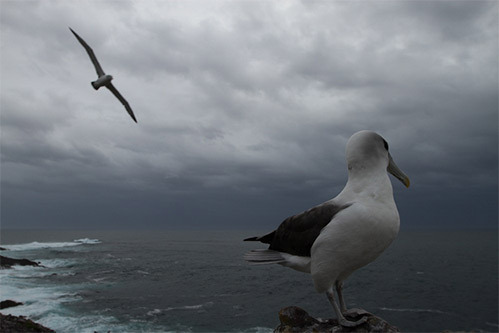 There are three islands dotted around Tasmania that the shy albatross calls home, Pedra Branca, the Mewstone and Albatross Island. Pedra Branca and the Mewstone are far out to sea in the Southern Ocean and Albatross Island is nestled between the north-west tip of Tasmania and King Island in Bass Strait. The 2015 adventure was to get a glimpse of the shy albatross and find out more about the lives of these and other seabirds, and to discover what’s special about islands and the plants and animals that inhabit them. Rachael Alderman is a biologist who knows these birds and this area as well as anyone. You can still help her by doing the student-science project to monitor nesting sites through photographic analysis. Students from K-6 can relive the journey in their classrooms and access the lessons anytime. The discussion panels with Andrew and the science experts that occurred during the live expedition are now closed.